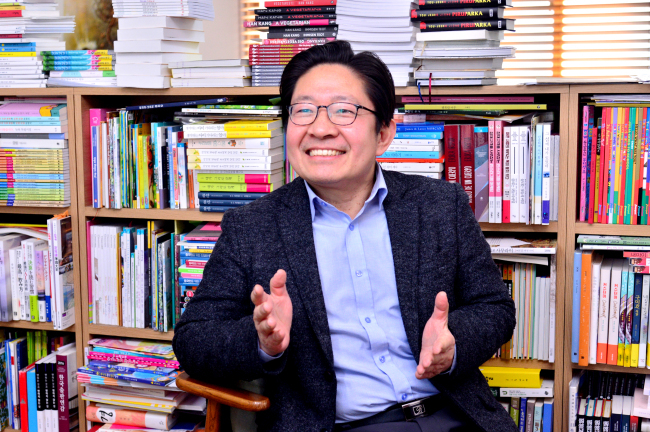 If you are living outside Korea and happened to have just finished your first volume of Korean fiction, the chances are that the book you’ve read was brought to you by literary agent Joseph Lee and his partners around the world. “What’s the secret behind the monopoly?” I asked him half-jokingly, as we sat down for an interview at his office in Seoul’s upper district of Seongbuk earlier this month. “There’s no one like me,” was his half-serious reply. It seems Lee has come a long way. In 1995 a young Joseph Lee was a literature lover who landed on the world of book publishing with little knowledge of the industry. As a novice agent under a leading local firm, Imprima, his job was to bring works of famed foreign writers -- the likes of Alice Munro of Canada and the late Jose Saramago of Portugal -- to Korean readers. It was what other book agents in Korea all did at that time. When it came to literary translation, the trade was one-way. He held onto that idea for years and tried, whenever possible, to introduce his overseas partners to some of Korea’s best-sellers, with brief synopses that he wrote in English. Looking back, he was clueless about how tedious arranging a book translation was and how important it was to find the right publisher for any book to reach foreign readers. Then a breakthrough came in 2005 as a result of both preparation and luck. Lee attended that year’s Book Expo America, where all major agents and publishers in the Anglophone world had gathered. Fixed on selling compatriot novelist Kim Young-ha, he had prepared a pitch for the author’s debut novel, “I Have The Right To Destroy Myself,” with a synopsis, a few translated chapters -- an outcome of a literary translation grant -- and a paperback edition of a French-language version of the book, published in France in 1998. The book’s early French debut was a result of “pure luck,” author Kim once said in an interview, describing it as a solitary event that began with a home visit by a Korean-French translator with links to a French publishing house. The book’s debut on the US book market in 2007, and the long and tedious process that made it happen, were an eye-opening experience for Lee. The following year, Lee made another serious pitch, and Jo Kyung-ran debuted in the US with novel “Tongue” in 2009. His third project was Shin Kyung-sook’s “Please Look After Mom,” which was an instant sensation upon its release here in 2008. The heartbreaking story of a mom and her family’s search for her after she goes missing is told in shifting voices of four different people, including the mom herself. Landing on US bookshelves in 2011, the book has racked up total overseas sales of around 2.1 million copies and has been published in nearly 40 countries. It is still the only Korean work of fiction to have made it to the coveted list of New York Times best-sellers. In October last year, Lee announced the inking of a deal for the prose’s adaption into a US TV series. “‘Please Look After Mom’ certainly opened the door wide for Korea authors,” he said. It also did so for Lee as their representative. Now Lee has his hands full with a wide range of Korean titles reaching far beyond the Anglophone publishing world. But he tries to spend as much time as possible doing his core job as a literary agent -- discovering gems hidden in Korea and delivering them to global readers. The environment is now ripe for a broader and deeper wave of Korean literature, he says. Books being translated into foreign languages are becoming diverse in genres -- from horror and mystery to fables for adults -- he stressed. Asked to give a heads-up on Korean authors to look out for, Lee mentioned relatively new authors in their 30s and 40s: Pyun Hye-young, Choi Eun-young and Lee Ji-min, among others. Despite having only a few books here in Korea, these writers are already catching the attention of global publishers with their unique styles and stories, he said. “The Hole” by Pyun, a dark horror story, won the Shirley Jackson Award last year, one of the most prestigious in the genre, while Choi’s debut short story, “Shoko’s Smile,” received positive responses overseas, which Lee said was very encouraging. Near the end of the interview, the agent showed a German copy of Jeong Ho-seung’s “Loving,” which had just arrived. Titled “Liebende,” it is awaiting its debut in the country, with 100,000 copies to be printed in the first edition, he said. “100,000 is pretty big for a first edition. It is on par with ‘Please Look After Mom’ in its US debut,” he explained.